To extend the life of your retractable awning it’s important to consider preventative maintenance. Preventative maintenance will keep the retractable awning from needing replacement. The goal is to save money where you can so you don’t have to pour money out of your bank account for replacement canvases or even replacement hardware for your retractable awning. Preventative maintenance is very simple to implement with a new or old retractable awning, and you will be saving yourself from troubles down the road. There are 7 tips to implement with the care of your retractable awning that can be considered best practices. The first tip to care for your retractable awning is to do a function check of your automatic or manual retractable awning. During off seasons, extending or setting up your retractable awning will keep the hardware from blending together, making it difficult to open the awning during regular seasons. 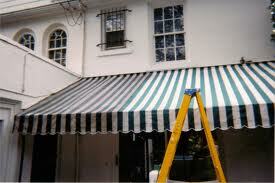 Try and set up your awning for a visual and mechanical inspection at least once a month. The second tip is to inspect the joints and hardware when the awning is being setup. Listen for squeaks, or look for kinks in the poles. Sometimes wind can keep the awning from lining up properly when closing and opening the awning, creating kinks in the poles. Finding these subtle bends and finding where the squeaking sounds are coming from will help you find a solution to keep it from happening again. A recommended third tip is to look for rust spots or minor build ups. Finding these rust spots will save you a lot of money in replacement parts. Moisture can build up in the joints or screws of the retractable awning. If this rust builds up, it can fuse the components together or even degrade the integrity of the materials. A good way to handle this minor problem is to use a little lubricant, such as WD-40, to not only clean the rust spots off the awning but to help with extending and retracting the awning while adding a layer of protection from moisture from accumulating in the future. Also check your awning fabric for green mold spots as well. Mold can eat away at your awning fabric very quickly. If found you can use a anti-mold agent like this one. I also recommend people keep something like this on hand as once mold appears time is of the essence. The fourth tip for keeping your retractable awning in check is to use a broom to brush off the dust in the joints of the awning. Dust and other debris can grind the hardware of the awning and even strip the paint off the poles. If this happens, it can be a threat to the hardware, as rust can start to form. A quick brush from a kitchen broom to sweep these joints when the awning is set up once a month will help extend the life of the awning as well. The fifth way you can clean you retractable awning is by looking for canvas flaws or tears. If the seam of the awning is becoming frayed then you will need to fix it before a gust of wind strips the canvas and tears all the way. If this happens, you may as well get a new awning, which can be costly. If you discover a small ripped seam or fray, a common solution would be to use clear finger nail polish to apply to the area that is getting ripped or frayed. This will keep the canvas from ripping more. Tip number six is a simple cleaning method but it’s very important. The gear box, or pulley system of your retractable awning can also get debris built up. A can of air can be used to blow out the dust, leaves, or dead bugs. The buildup of this debris may not seem like a big deal but the motor or pulley system that extends and retracts your awning can become flawed, rendering your awning useless. The seventh and last tip is to make sure that every time you use the retractable awning you inspect it after every use. It might seem tedious but knowing what condition your retractable awning is at all times can help you prepare for maintenance the next time you need to condition your awning. © 2010-2016 Retractable Awning Review. All rights reserved.